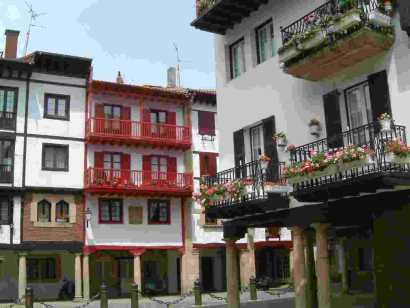 Hondarriba (otherwise known as Fuenterrabia) is a historic border town (in N Spain) which is easily accessible from the harbour at Hendaye (in France) using a delightful little ferry which crosses the mouth of the river separating the two countries. The ‘old town’ is encircled by imposing battlements protecting an inner castle which was built in the 16th Century as a refuge from pirate raids. The old ‘walled city’ is full of interest and the ramparts themselves and the enclosed village are a delight. In fact, the houses and villages on both sides of the border are very picturesque and the whole excursion makes a worthwhile daytrip for the more adventurious or for those with want to try out their Spanish. …………………Hendaye (in France) used to be one of the busiest frontier crossings in Europe and whilst the customs post on the motorway is now deserted the main seaside resort is as vibrant as ever. It has a large beach at the mouth of the river Bidasoa and it can be reached with relative ease from Labenne. San Sebastian (known as Donastia in Basque) is another attractive Spanish town which is easily accessible from Labenne by car and you can call en-route at the village of San Juan which is quite unique and of special interest for visitors: the single narrow street at times almost disappears under the surrounding houses. But if you are seeking a little adventure try the Metro train from Hendaye to San Sebastian which is an interesting and inexpensive way for everyone (including your car driver) to see the surrounding countryside – there is a regular commuter service from Hendaye. Further afield and inland is Pamplona the site of the famous bull-run through the streets of the town.